Here are the answers to the most commonly asked questions about a paycheck advance. What is a paycheck advance? A paycheck advance is a smaller, short-term loan designed to help you cover emergency expenses until your next payday. A paycheck advance is a quick, convenient source of cash to help you take care of those unexpected, urgent expenses. In many ways, it's like receiving a payday early, which you then repay when your next paycheck actually comes in. Repayment options may vary depending on your lender. How do I sign up for a paycheck advance? Signing up for our paycheck advance lender matching service is easy. You can begin by clicking “start now” anywhere you see it on our site. We will ask you for some basic information, and our lenders will determine whether or not you qualify for a loan. How much of a paycheck advance can I get? 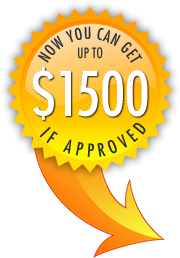 If approved, you can receive up to $1500 by the next possible business day. This may vary depending on your lender. How long will it take before I have my paycheck advance? After you have been approved you could have your money deposited into your account by the next possible business day. This may depend on your selected lender. For informative facts on paycheck advances, see our Paycheck Advance Facts page.